If you are in employer in Germany and are on the lookout for manual handling regulations and ergonomic risk assessments (tools and guidelines) for lifting, holding, carrying, pushing and pulling, we are happy to tell you that there is a decent amount of material available for you online. As the regulations of the manual handling of loads is a fairly complex political field with lots of different players, it can be quite difficult to find out how everything is interconnected, and what information is relevant for you and what is not. - Provide you with a quick explanation of how the political arena is strung together. This is necessary in order to find out who is responsible for what when it comes to manual handling regulations in Germany. - Present links to user-friendly tools for making ergonomic risk assessments for lifting, holding, carrying, pushing and pulling. The parties and social bodies involved in dealing with the issues of safety and health at work in Germany are as mentioned, rather plentiful. Lots of organizations and agencies are coorporating and distributing various areas of responsibility among each other. In this section we will present a rough overview of this coorporative network in order to find out who does what. In Germany the system for safety and health at work consists of an alliance between the federal government, the federal states and the accident insurance institutions. This alliance is also referred to as The National Occupational Safety and Health Conference (NOSHC), also sometimes apparently referred to as NAK. In order to comply with and reach the preventive EU-objectives regarding manual handling, in 2008 NOSHC created the Joint German Occupational Safety and Health Strategy (GDA, also referred to as the Joint German OSH Strategy). The overall nature of this GDA policy is preventive: its aim is to improve and protect the safety and health of workers, while at the same time working towards raising employers' awareness of workplace risks along with the benefits of taking preventive measures. Their way of manifesting GDA in action is by creating procedures for supervision of and consultancy for companies, as well as developing a way of communicating the rules and regulations in a precise and user-friendly manner that busy employers can easily follow. NOSHC is located at the Federal Institute for Occupational Safety and Health (BAuA) (BAuA = Bundesanstalt für Arbeitsschutz und Arbeitsmedizin) in Berlin. Appointed by the Federal Ministry of Labor and Social Affairs (BMAS (Bundesministerium für Arbeit und Soziales)), BAuA also acts as the national focal point for the European Agency for Safety and Health at Work (EU-OSHA). The implication of being a national focal point for EU-OSHA this is that BAuA is responsible for 'translating' the legal framework from the EU e.g. Directive 90/269/EEC (also referred to as the Manual Handling Directive) into something that is directly applicable in the workplace. Basically that means translating the law into concrete and easy-to-understand guidelines and ergonomic risk assessments for employers and workers. (reference in English / in German). Thus most of the material on manual handling in Germany (ergonomic risk assessments and guides to lifting, carrying, pushing and pulling) are created by BAuA. The Ordinance on Health and Safety Requirements for the Manual Handling of Loads at Work (in German referred to as the Lastenhandhabungsverordnung, or LasthandhabV) serves to implement the afore-mentioned Directive 90/269/EEC into German national law. This happened in December 1996. The main objectives in the Lastenhandhabungsverordnung is to clarify the responsibilities of the employer. It is the employer's responsibility to perform ergonomic risk assessments and to take preventive measures in case of risks to ensure that workers do not risk accidents or injuries such as e.g. MSDs because of unfortunate and too strenuous manual handling. However, this Lastenhandhabungsverordnung document is not practically orientated, so in order to have something that can actually be used in the field by employers, BAuA has developed something called the Leitmerkmalmethode. The Leitmerkmalmethode is a simplified ergonomic risk assessments procedure that can help employers risk assess manual handling scenarios at work. The guides also contain ergonomic risk assessments for employers to fill out. 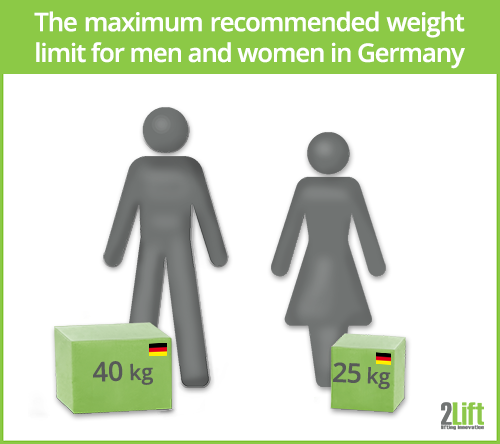 In Germany, as well as in most other countries, how much you are allowed to lift and carry at work is not a constant. By this we mean that there isn't a fixed weight of a load that applies to all scenarios of manual handling. The more complex and demanding the manual handling task, the lower a weight is allowed to be lifted / held / carried. This means that whenever the lifting, holding or carrying becomes less ideal e.g. due to an awkward posture, twisting of the trunk, repetitive lifting or a long distance for carrying etc., the weight of the load has to be reduced in order to prevent injuries. If this isn't possible, then preventive measures are recommended such as e.g. workplace reorganization and / or mechanical aids. In order to find out if the manual handling task constitutes a risk, ergonomic risk assessments such as the Leitmerkmalmethode has been developed. The Leitmerkmalmethode for performing risk assessments for lifting, holding and carrying is fortunately fairly straight forward to fill out (Here is an example of how to calculate the risk values pertaining to a certain manual handling task. The main reason for its relative simplicity (as compared to e.g. the NIOSH Lifting Equation), is that the variables don't have to be exact but only has to represent a span of approximate measures where you just have to choose those you consider closest to your reality. type of body posture during the lifting process, etc. All answer options are provided with a risk value that you insert in a calculation at the end in order to find out where the manual handling task is placed on a risk scale from going from low to high risk. If you want to orientate yourself more in this in an easy-to-understand and user-friendly document, you can go here: Heben und Tragen ohne Schaden, which contains both ergonomic guidelines and ergonomic risk assessments. This Leitmerkmalmethode risk assessment sheet for pushing and pulling is built in a very similar way to the one for lifting, holding and carrying. posture required for the pushing and pulling etc. To see how to fill out the risk assessment sheet for pushing and pulling, you can take a look at this high risk example. If you want to orientate yourself more in this ergonomic risk assessments subject, you can read this: Ziehen und Schieben ohne Schaden, which, like the one for lifting, holding and carrying, both contains guidelines along with the Leitmerkmalmethode risk assessment. Other publications on the risks related to manual work processes can be found on this page on the BAuA website.